In this case my great-grandfather’s great-grandmother Abigail (Slade) Fitts (1777–1874) of Ashford, Connecticut, was identified as the daughter of Jonathan Slade and Anna Salisbury. Their ancestors were continued on charts 12 and 13. However on chart 12, Jonathan Slade is also identified as a son of Jonathan Slade and Anna Salisbury. Was this really true? In this case, no. Basically a full generation was added. 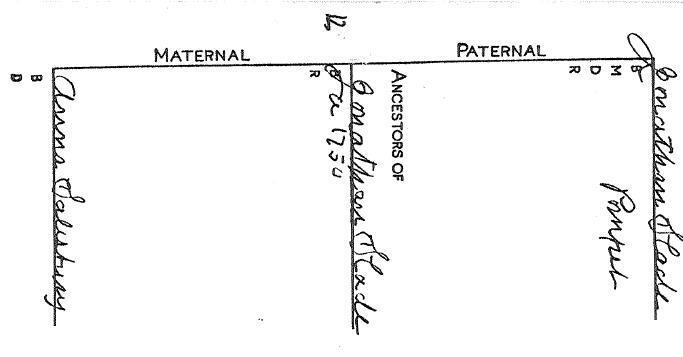 Abigail’s father Jonathan Slade was the son of Benjamin and Abigail (Mason) Slade, who on chart 12 were identified as his “father’s” parents. However, there was more wrong with the chart than just that. Benjamin Slade was identified as the son of William and Sarah (Holmes) Slade, when in fact they were Benjamin’s father’s parents (since Benjamin was the son of William Slade Jr. and his wife Hannah Mason). So while the chart had two Jonathans, one Benjamin, and one William, in reality it should show one Jonathan, one Benjamin, and two Williams. Sarah (Holmes) Slade was the daughter of Rev. Obadiah Holmes (1607–1682) and his wife Katherine Hyde of Newport, Rhode Island, who provide me with my distant kinship to President Abraham Lincoln, so I was quite interested in correcting this kinship early on in my genealogical research. Another example of “seeing double” was with my “former ancestor” Captain Benjamin Child (1685–1771) of Woodstock, Connecticut. 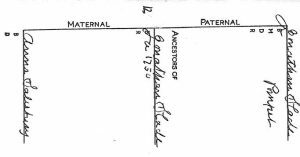 Elias Child’s 1881 Child genealogy claimed Benjamin married Patience Thayer of Mendon, Massachusetts, in September 1712, and that their son Benjamin Child, Jr., married about 1740, Patience _____. In Clarence Bowen’s Genealogies of Woodstock Families, the 1712 marriage of Benjamin Child and Patience Thayer is repeated, but it also indicates that their son Benjamin married Patience Thayer of Mendon, with intentions published in Woodstock on 25 September 1740. In this case, it was the younger Benjamin who married Patience Thayer. Perhaps Elias Child confused the two Patience spouses, as father and son both married women of the same name, merging the son’s marriage intention with that of his parents, who have no surviving marriage record. In this case, Bowen then repeated the earlier error and “added in” the correct fact of the later marriage of the younger Benjamin. The elder Benjamin, as far as can be determined, married Patience _____ about 1712, while their son Benjamin married Patience Thayer in 1740. In both cases, where we were “seeing double” occurred on different pages, so the error was not immediately noticed. I’m sure there is an example where a man did marry someone with the same maiden name as his mother, but in these examples, this doubling turned out to be an indication of further work needed. H.L. Peter Rounds, Vital Records of Swansea, Massachusetts to 1850 (Boston: NEHGS, 1992), 197 (1770 marriage of Jonathan Slade and Anna Salisbury), 171 (1744 marriage of Benjamin Slade and Abigail Mason), 207 (1715 marriage of William Slade and Hannah Mason); Gary Boyd Roberts, Ancestors of American Presidents (Boston: NEHGS, 2009), 49–52 for Lincoln’s descent from Obadiah Holmes. Elias Child, Genealogy of the Child, Childs and Childe Families (Utica, N.Y.: Curtiss & Childs, 1881), 243; Clarence Winthrop Bowen, The History of Woodstock, Connecticut: Genealogies of Woodstock Families (Norwood, Mass., The Plimpton Press, 1930), 3: 479, 490–91. My article, “The Parentage of Sarah Child (1724–1805), Wife of Jedidiah Morse of Woodstock, Connecticut, and Other Bicknell, Child, and Morse Corrections,” Register 159 : 317–24, establishes that Benjamin and Patience’s daughter Sarah Child, born in 1722, DID NOT marry Jedidiah Morse, the grandparents of inventor Samuel F.B. Morse. The problem of the two generations of Benjamins and Patiences is discussed in Gwen Sanders Cravens, The Sanders Family of New England & Some Connected Lines (Mt. Vernon, Ind. : Wiedrich Pub., 2003), 142, 472 (which does repeat the error on Sarah Child, which is corrected in my above article), and Ann Smith Lainhart, “Five Case Studies in Genealogical Research,” The Essex Genealogist 8 : 117–18, which also proposes the theory the elder Patience might be Patience Holmes (1683–after 1709), daughter of Nathaniel and Patience (Topliffe) Holmes of Roxbury, Massachusetts. Last year, I discovered a line of descent from Mary (Holmes) Brown, daughter of Rev. Obadiah Holmes (1607–1682) and his wife Katherine Hyde of Newport, Rhode Island. Thank you for alerting me to our kinship with President Lincoln! Thanks for sharing that link Perry! I run into this with my family as well. Luckily when my family’s genealogy was written, it was done by a genealogist who spent many years working on it. But even so trying keep straight the various generations is difficult because my family has a habit of naming the next generations after the previous generations. It does make it look like the same generation has been reborn again. To top it off when a child died early the next child was sometimes given the same name as the child who died And, distant branches of my family in other parts of the country use the names that we use. It helps me to find relatives but it confuses me when I’m trying to sort this out. Even today we all use nicknames for ourselves because we have so many people with the same first and last names. Rev. Obadiah Holmes and Katherine Hyde are my 10th great grandparents, so, hello, cousin! This article reminded me of my third and fourth great grandparents from Somerset County, Pennsylvania: both father and son were named Jacob Weyand, and both married women whose maiden name was Miller. In this case, the Millers were two distinct families with no shared ancestry. Hello cousin! I’ve had a similar experience with two distinct Miller families marrying to the same family. Stay tuned! I thought Obadiah Holmes sounded familiar. When I looked on my tree, I found he is my 9th great grandfather. I didn’t know of our connection to Lincoln. My teenage nephew was particularly excited to hear the news. He dressed as Lincoln one Halloween. Thank you! You are welcome cousin! I learned of this connection when I was 14, so I was excited as well. Are you sure Sarah Holmes wife of William Slade was d/o Rev. Obadiah Holmes? His will did not mention a daughter Sarah. I’m trying to confirm that Sarah was actually d/o his son Jonathan.